Natalie starts first grade in two weeks and I've been thinking a lot about ways to send healthy, tasty lunches with her to school...without ending up with soggy sandwiches, lukewarm veggies, and mushed fruit. Rubbermaid came to my rescue again with their new LunchBlox kit...and they're giving away kits to three lucky Serenity Now readers! Keep reading for details, and to enter! 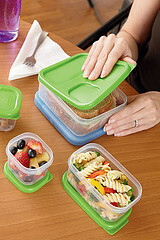 The LunchBlox Sandwich Kit is exactly what it sounds like: a building block set of containers to keep your lunch cool. It comes with 2 snack containers, 1 side container, 1 sandwich container (fits regular and specialty bread), and 1 Medium Blue Ice(TM). They also offer separate kits! Works for an adult or a child's lunch. You could easily use a small snack container for dips (peanut butter, ranch, avacado, salsa, etc) or crackers. Tired of sandwiches? Use the sandwich container for chicken and add rice and veggies to the side container. There are all sorts of combinations! They really do stack well. I was skeptical as to how the containers would stay stacked in a lunch bag, but each piece has a lid that allows other pieces to stack on top of it, and a "lip" on the bottom that fits with those lids. Still very easy for a small child to pull off, but locked enough that you won't have containers jumbling around in your bag. If you keep track of your portions, you'll love the LunchBlox because each container is clearly marked with the appropriate measurements (cups, oz, or ml). Blue Ice (TM) keeps your meal cool on the go! If you're on the hunt for on-the-go lunch containers, the LunchBlox is the perfect way to save space in your bag and keep your meal cool and fresh! It is currently available for sale at Target, Rubbermaid.com, Kroger, Kmart, Safeway, Bi-Lo, Winn-Dixie, HEB, other grocery stores, and select WalMart store. 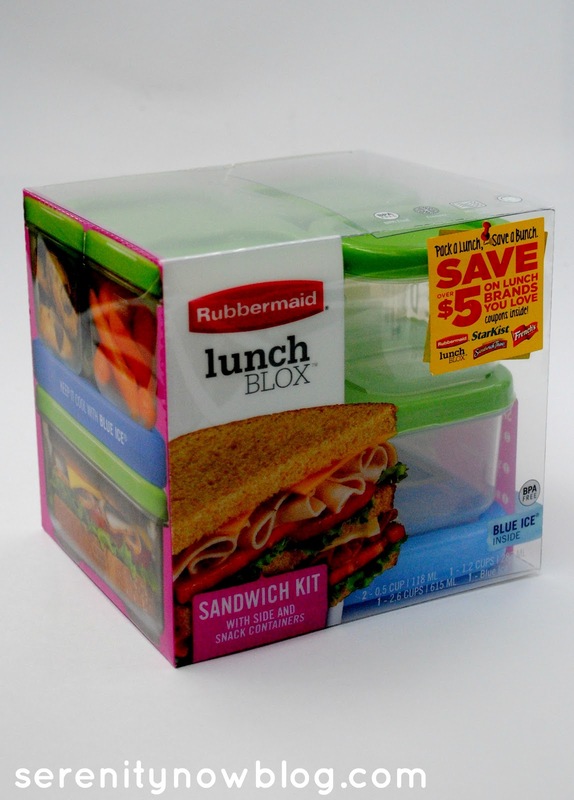 Rubbermaid is giving away 3 LunchBlox kits! Get your party hats on! My Weekend Bloggy Reading link party is scheduled as usual for tomorrow morning (8 am ET), so be sure to swing by with your best post of the week. Disclosure: I received a LunchBlox kit from Rubbermaid to review, but was not compensated financially for this post. All opinions are, as always, my own. I love this idea - I have seen this in a magazine and wondered if it would help me pack my lunches on the weekend. Looks like a unique idea! Honestly, I want the sliding wire baskets. It isn't a kit, I know. The Lunch Blox kit looks great too! These containers are great! 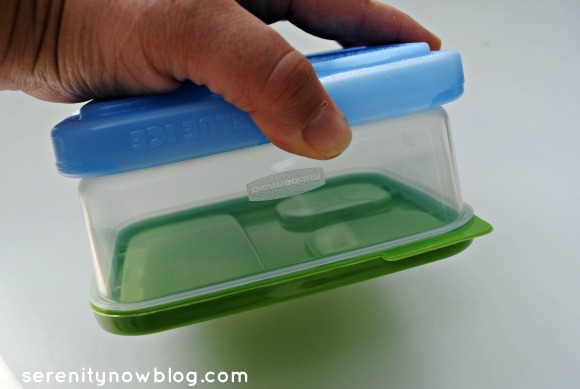 I try using plastic containers as much as possible to cut down on using so many little ziploc bags. Thanks for hosting the giveaway! I probably like the sandwich kit best with the entree a close second. I bring a lot of leftovers for work, so either would be very adapable. Thanks for offering the contest through your blog! Love this! thanks for the chance at a great giveaway! I could really use this for school. Most of my containers are worn out and I like the style of this set. The takealong twist and seal looks like a good one. I love the salad kit set. I definitely need something like that in my life! I was just looking at these containers at Target! I love the Entree Kit! It would certainly make it a lot easier for my husband to take a healthier lunch to work with him. I was looking at these for his birthday gift! After your review, guess what hubs will be getting for his 46th birthday! I like the lunch bags that go with the lunch blox. So clever! I'm thinking probably the sandwich kit. The sandwich kit would be great for sending to school with the kids. I like the sandwich and salad kit! I would love to find the "perfect" lunch container! Just two days ago I put some lunch containers in my cart because I am needing them so much... ended up not buying them because it wasn't what I was looking for... these are going to be great if I get them! Thanks for the opportunity Amanda... Hubby will be happy to take these to work with his lunch! These would be great to have! I love how they stack and like the colors too. These look like the perfect thing for a school lunch. I would like the sandwich kit! Maybe my daughter would want to take lunch to school with this! I like the sandwich kit. I think the entree kit looks amazing also. 1 container separated for 2 things. The lunch box set would be perfect for anyone's lunch. Cold packs as part of it great. I love the sandwich kit. My boys will think it is so fun and much better than using dozens of ziploc bags. The lunchblox entree kit would be awesome for outtings with the kids. How exciting these look! I have a 6 year old and a 2 year old that I pack lunch for every day and these would be perfect!!! I like the LunchBlox™ Entrée Kit. How fun! I like the entree kit! This is awesome!! Is it sad that I'm soo excited about something like this? haha My daughter is starting 1st grade too, and I'm looking forward to packing her lunches. I already have a bunch of 3 compartment containers, but I love this idea that these all 'lock' together with the ice pack. Very cool! The sandwich kit looks great! Thanks for the opportunity to win this great giveaway! The salad kit would be perfect for me!! Would love to try the entree kit! love your blog! would like to try the sandwich kit - would be great for my husband's lunch!!! Lunchblox Sandwich kit would be perfect for me. This is like a lego lunchbox...only the box is the lego! So cute! I think the LunchBlox™ Entrée Kit would work best here! PS - I love your blog! The sandwich kit would be perfect for my boys' lunches! I most want to try the LunchBlox™ Entrée Kit. I love both the Sandwich and Salad kits. I love these kits. They would be perfect for lunches. Great contest for back to school! We start in 2 weeks! Yikes! I'm not as prepared as usual! Oops! Hit enter too soon. I would like the entree kit.